Received my results last week and feel a real sense of achievement in gaining this MA. It has been a very rewarding process and one that I will appreciate even more fully with time. Showed at Empty Shop over this week end as a studio member and it has been a positive experience and1st step in this transition forward on from the course. Used vinyl text and x3 MP4 players to show video and it is exciting to see ideas take off so quickly following on from the course. I felt that it should be a separate project from this one which has been a means record my ideas and work for the past 3 years for the MA degree. 1. Realise the Project Proposal and prepare towards final exhibition. My project proposal has been to confirm if there was a link between our non body movements and our identities. Following on from the research I carried out in unit one I spent unit 2 working with video and photography in order to explore some of the issues to do with non body language movement, identity and the body as a site of social inscription. My 1st pieces were of walking bare foot on eggs and in the snow we had around Christmas and New year. These videos began to develop further with the opportunity arose to hire space at Empty Shop in Durham, and I could explore ideas more fully, such short pieces as in Meat, or Three Stones. These small videos gave the chance to begin to develop the ideas of my own physical responsibility in these pieces and explore issues of society’s use of the body reflected in language through the mediums of video and editing. 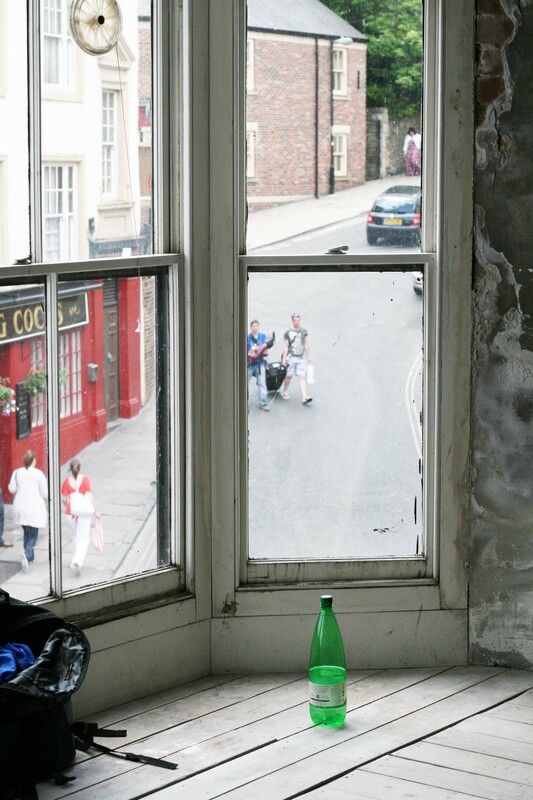 There was for me a degree of discomfort in producing edited video pieces and I wanted to extend the project in to a live feed work which I accomplished on June 13th as part of the show and documentation of work I held in Durham. These issues surrounding video, live broadcast and any subsequent documentation of live art are investigations I will carry forward after this MA. My preparations for the show have not been as straightforward as I would have wished and has required a degree of flexibility. Originally I planned for a projector from college to show my work. I was awarded this, but as time went by it became doubtful that I would be able to be in London for more than one day, due to parameters around family health issues. The fact that I would also be bringing the show catalogues with me (by train) and would need to get a student card from Wilsons Road, in order to be able to collect the projector from central stores, complicated matters further; as I knew that it was unlikely that I would have enough time or energy (due to my health) to be able complete the various tasks, at seperate locations, and install my space all in one day. So on finding out about the issues around the projector I made the decision to show in Durham at Empty Shop HQ and do a live feed actuation. This in its self was to be problematic as broadband connectivity became poor around this time, and I would find that I would often need the support of BT’s technical help team to re-establish connectivity. The space looked great when everything was set up, but again connectivity issues cut in on the 13th June with the live feed piece, and I had to move location in the building in order to broadcast, and managed the 2 hour live feed. I had hoped to live feed for the assessments and PV but connectivity issues have kept reoccurring and I was advised by Andy to have a video piece prepared which I am really happy with and will be shown on an imac at Camberwell with Censored zine, undertaken as part of Act Art’s censored event night. During one of the chat sessions for the show build I was asked if I would produce the show catalogues and Ina entrusted me with funds from the exhibition budget for this. I have felt a good degree of responsibility being asked to create the show catalogue; a labour intensive project with it taking 2 hours to print x2 28 page catalogues, and a further 4 hours to collate, hand stitch, and bind them with a target of 400 to complete! But iIt is really good to be able to put forward a physical commitment in this way to support the group show. Working towards the group show has been very a very rewarding process and encouraged me to develop new understandings, strategies and expectations. It feels really positive to have gone through this process. 3. Present a resolved body of creative practice that has evidenced the systematic enhancement of your knowledge and understanding. Creating the video works was fundamental to this project as they really challenged me to pare back on content, be braver both visually and with physical content and really to focus on movements; to present often uncomfortable movements in a documentary, impersonal fashion. 1st live cast work Walking on eggshells which began to look at phraseology to do with walking and to test livestream. 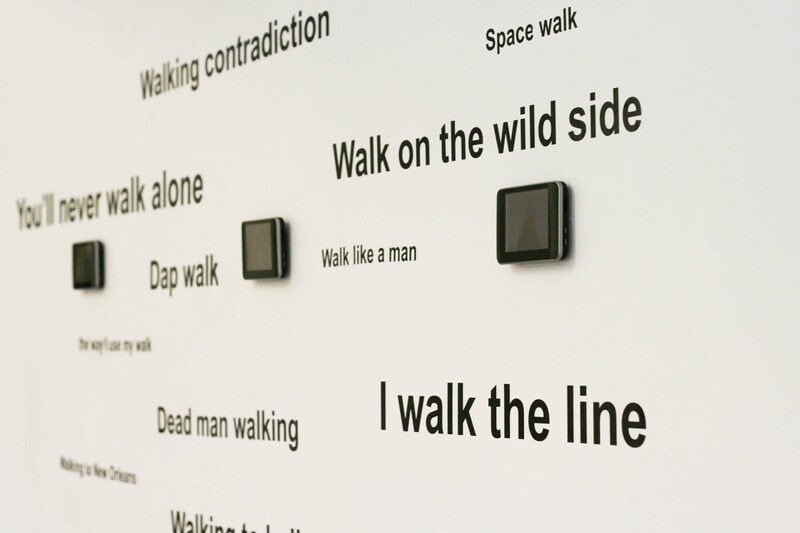 Text piece: (again included in the walk the line documentation) phrases in popular culture referring to walking and reflecting its often unspoken but frequently implied significant role. 4. Analyse and reflect upon your own practice and others throughyour presentation at the programmed symposium forming a synthesis of your practice-based research. The symposium was the 1st opportunity as an online student to fully interact with all fellow students on the digital arts MA . It provided a mile stone for me to see my project alongside and in the context of my peer’s symposiums which were all professional and exciting. Having a peer frame work has been both inspiring and supporting way of learning and provided a more influential part of the online learning experience than I expected. After the symposium at the suggestion of my tutor, I put a short questionnaire together with video clips asking for feedback from my peers. This peer feedback was something I could then expand on when working in Empty Shop and could ask for the response of studio holders to walking the taped line for the Walk the Line piece. One of the out comes of the responses to my questionaire was to develop contact with Sara a face to face student; I have been lucky enough to be able to collaborate with Sara Choudhrey in producing a small book of her work. It has been fantastic to share a project in a hands on way and Sara’s work is very exact in its execution which has challenged me in this project to try to match it as far as possible. She has been very patient and an excellent communicator to collaborate with. In the unit 2 essay I out lined some plans for future development, focusing on applying for a PhD. Since then I have been fortunate enough to be offered a studio which will allow for a continued practice development. There are 3 forthcoming projects: Act Art’s Censored event night, Falmouth festival and a short show through the Meanwhile Project, Stockton-on-Tees. With planed attendance at the following workshops: ‘Writing on Air’, with Sean Burn and the Activ8 graduate workshop course held in Gateshead. Over these next few months I hope to consolidate and build on the work established through this MA and aim to continue with weekly web logging. The in put from both peers and tutors through out this MA has had a significant impact on both my creative practice and understandings; I am incredibly grateful to have had this opportunity to undertake the course.